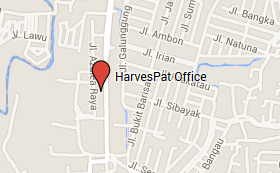 HarvesPat is an exclusive international intellectual property rights services firm having vast experience protecting its clients' Intellectual Property in Indonesia as well as abroad. We serve clients across the world, from Multi National Companies to small and medium-sized enterprises across a broad spectrum of industries, to entrepreneurs, and entertainers. We provide registration administration services for Patents (and/or Utility Models), Trademarks (and Geographical Indications), Copyrights (and/or Neigbouring Rights), Industrial Designs, Layout-Designs of Integrated Circuits; Trade Secrets, Plant Variety Protections, and Geographycal Indications. Further, we also at our best service in representing our clients should there is any IPR infringement or litigation before the Commercial Court (or further stage, cassation before the Supreme Court) within the Indonesian territorial. HarvesPat consist of chartered IPR counsels and technical experts having more than 15 (fifteen) years of experiences in the field. We also have numerous associates all over the world and have good and professional connections with the Officers in the Directorate General of Intellectual Property Rights and other IPR related Institutions. Finally, it is our goal to provide our clients with the best and efficient services for protecting your Intellectual Property Rights. So why spends faboulous amount for protecting your intellectual property assets when you can spend in less effective way through HarvesPat ? Nadya P.G. Djajadiningrat -	Founder, Advocate, IPR Consultant. Deny H. Soedarno -	Managing Partner, Petroleum Engineering, Patent Correspondences, Translator for: Chemical, Pharmaceutical, Physics, Mechanical, Drafter (in Bahasa). Stephanus Iqbal -	Accounting/Billing, Invoicing and Reminders. Arby Waskito -	IT/Computer Engineer, software-hardware backups, programmer, reminder systems. Sopiyanti -	English literature scholar, Patent Applications and Patent Annuities div. Rusdiana Mardlotillah -	Graduate Hospitality and English literature scholar, Trademark Applications & Renewals div. Gusdriana Satria -	IP Liason, IP Filing preparations. Eko Susanto -	Undergraduate Design, Designer, Trademark Logos, Patent Figures. Julian Budi Dharmawan -	Bachelor of Law, Legal Counselor, Head of HRD. Herni Pratikawati -	Bachelor of Law, Legal correspondences, Tax and VAT payments. Donna Ermina Tisnawati -	Japanese literature scholar, Corporate Secretary, General Correspondences. Brevenery Prima Yuditia -	Industrial Engineering, Patent Correspondences, Articles. Andhika Duta Pratama -	Bachelor of Law, Advocate, IPR Infringement and Litigations. Kiki Estrellita -	Civil Engineering, Patent Correspondences, Translator for: Construction, Physics, Mechanical. Farie Dolfinshy Tutu -	Civil Engineering, Patent Correspondences, Translator for: Construction, Physics, Mechanical. Fanny Rachim -	Civil Engineering, Translator for: Construction, Physics, Mechanical. Natasha Saskia -	Secretary and English literature scholar, Copyright/Layout-Design/Trade Secret div. Venna Adriana -	English literature scholar, Industrial Design div. Ades Adrian -	Branding Consultant.